⅗ parts Distilled plant matter, namely rye, wheat, or potatoes. ⅖ parts Various spirits of any kind. Vodka or gin is preferred. Increases potency of mixed ingredients. Causes severe alcohol poisoning when ingested. Vodacine is a distilled and purified alcohol composed of various spirits and grains. It is arguably the purest form of alcohol available in the modern day and is a commonly used base for many potions and decoctions. Though unsuitable for raw consumption, its properties allow the distillation and amplification of the effects of basic alchemical ingredients. 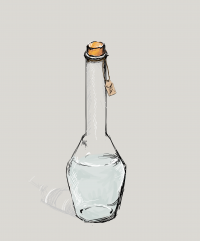 Because of its relatively simple method of preparation along with its innumerable amount of uses, the alcohol is a staple for any dabbler of potion-brewing. It is a readily available ingredient from herbalists and apothecaries, and easily available for commissioning from local taverns and breweries. Vocadine has an uncertain origin due to the lack of historical material regarding its initial creation. Many regard the standard recipe for Vocadine to be an Ailor invention, though its discovery and pioneering could have emerged from Nelfin or Allar alchemy. More zealous alchemical historians say that the original Vocadine was a Seraph innovation which had been adopted by the various races that emerged from their ruin. Whatever the explanation may be, the alcohol was widespread and used in many cultures by the time of the Second Void Invasion. It has a highly antiquated and revered reputation in the modern day. Preparing Vocadine has become an easy, if not specialized procedure due to modern innovation. Making the alcohol requires several distilling and filtering mechanisms, and can therefore only be created by breweries that possess the equipment. To brew Vocadine, one must distill sugar-rich plant matter such as potato, rye, or wheat. Once the base product is formed, it must be continuously filtered and re-distilled with various strong alcohols of any kind until a clear water-like appearance is achieved. With its primary use as a base for potions, Vocadine is often mixed, distilled, boiled, or reduced with other ingredients to make the concoction. Some enterprising alchemists also have taken to steaming it at high temperatures to infuse its fumes into a dust, or add small amounts to a mortar and pestle when grinding down herbs or minerals. It is easy to tell when the Vodacine has absorbed the essence of its additives, as its clear color is easily lost with any contamination. Straight Vocadine, when ingested, causes immense stomach pain and eye dilation to all, regardless of race or temperament. This often leads to vomiting and dizziness as the alcohol poisoning starts to set in. Even races such as dwarves or orcs that are reputed to have alcoholic resistance are easily keeled over and harmed by the potency of the alcohol. Consuming even moderate amounts of Vocadine can cause debilitating illness and possibly death, as the body is unable to process the high content of ethanol. The effect is easily reduced to minimum potency by the introduction of any other flavor or essence from other ingredients, making it an easy addition to alcoholic drinks alongside any alchemical uses. When used as a base for potions, Vocadine has the miraculous tendency to bind, combine, or augment the effects of added ingredients without fear of dilution. Any addition made to the pure alcohol will eliminate its scent, allowing for advanced brewing utilizing the evaporated fumes of the alcohol. Vocadine is introduced early in the progression of alchemical study, and features in many levels of potion-brewing from simple infusions to extremely complex recipes. Vodacine appears much like any other clear alcohol, as it is crystal clear and behaves like water when still. The smell is what characterizes it among other alcoholic beverages such as gin or vodka, as it reeks of alcohol to an eye-watering measure. When spilled on cloth or skin, the smell tends to remain for days in spite of any washing or cleansing done. There are many historical cases of Vocadine-related deaths, often consisting of a reckless or otherwise ignorant drinker consuming large amounts of the alcohol. Most of these victims appear to be dwarves and Northerners. Vocadine is an easy method of spiking or increasing the strength of an alcoholic drink without noticeable difference in taste or volume. Establishments in high society often have a bottle of bar-use Vocadine for those looking to become intoxicated quickly. There are a series of regulations regarding the purchase and distribution of Vocadine, notably the specialized bottles that are used to measure size and value. It is a punishable offense in many trade-involved nations to sell Vocadine without utilizing the proper bottle, which can easily be procured from a trade office, apothecary, or glassware shops. Many take to recycling their bottles. This page was last edited on 18 June 2018, at 16:01.